Often times we can go about thinking about things we are grateful for and think that we really don’t have much to give thanks for. We draw a blank in a sense. But when you really stick to the process, you can find an abundant amount of things to show gratitude for and about. You open up the floodgates and gratitude just seems to pour out of you. But I understand that this is a process. 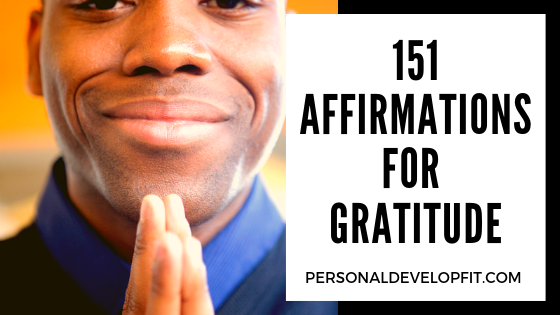 So that is why I created this list of 151 affirmations for gratitude. To give you a head start on the things you are thankful for. And to spark the beautiful and lovely feeling that showing gratitude gives to it’s giver. Here is the list. I hope you enjoy it. I am grateful for everyone who has touched my life. I am grateful for the oxygen in my lungs. I am grateful to be alive at such a time where there is so much possibility. I am thankful for my ethnicity and all it has taught me. I choose to have my legacy be centered around gratitude. I am so grateful for my passions and the happiness they bring me. I am thankful for teachers of all sorts throughout my life who have helped me mold my mind. I am thankful that my body heals itself and brings me restoration. I am thankful for sleep for it helps me restore my mind and body. I know that even in tough times, I can still find things to be grateful for and it helps me rise above it. I find deep pleasure in the human existence. I know that what I have out must come back, that is why I show gratitude constantly. I am becoming more grateful each and everyday. I am in constant awareness of the things I am grateful for. I am grateful for each day, but leave each day behind so I can welcome new ones with open arms. I naturally find many things throughout the day to be grateful for. I find myself easily starting each day thinking about all that I am grateful for. I am grateful that the people who love me and I love are still alive and in my life. I am grateful for having the time to spend with people in my life that are no longer here. I am grateful that I have a chance to reach my goals and dreams. I am thankful for the people who learned the path before me so I can walk it easier. I am grateful for my intuition which guides me brilliantly. Thankfulness is a way of life I am fully committed to living to. I am the living embodiment of the world gratitude. I am perfectly grateful right here and now. I often find myself in a deep state of thanks and gratitude. The universe continues to give me more and more to be grateful for. The new me is so thankful and grateful for all that I have in my life. The more grateful I am, the more good things are brought into my life. I am thankful for my mind and the masterpiece that it is to help me through this life. I am grateful that I have a safe place to sleep. People feel so grateful to know me. My purpose is being fulfilled by living a life full of gratitude. I find myself dreaming about all the things I am grateful for, giving me pleasant rest. I find it easier and easier to be grateful for the things I have in my life. Feelings of gratitude ooze out of each of my pores. I am grateful that hunger is not a big problem in my life. Gratitude is my new way of life. I am thankful to have influenced people and made their lives better. I am grateful for all the accomplishments I have achieved in my life. I am even grateful for people who have it worse than me to show me that I need to be grateful. I am grateful for gravity keeping me on the ground! I am thankful for coffee and energy drinks that keep me flying high throughout the day. I am grateful for all those who have given me random acts of kindness. I always show people my grateful nature. Gratitude flows through all my daily acts. I find people showing more gratitude to me, making me feel loved and appreciated. I am grateful for all the lessons life has taught me. I am grateful for the capability to love and be loved. I am grateful that I have made it this far in life. I am grateful for old friends and new friends. I am a natural at giving gratitude. I am thankful each day for it is another day to give love. I am grateful for the goals I have set and the hope for the possibility to accomplish them. I am grateful for the power of hope and the role it’s played in my life. I am grateful for the internet for it saves me so much time in research. I am grateful for the streets I drive on. I am a giver of gratitude. I find people coming into my life of whom I am grateful for their existence. Gratitude is a big healing force in my life. I let go of all things that are getting in the way of me being in a perfect state of gratitude. I am grateful that I have a job and can pay the bills. I am grateful that my car started this morning. I am grateful for all the good books that I have learned and enjoyed. I am grateful for the cinema for it helps be transcend my world and current problems. I am grateful for my problems for they are leading me to a better future. I am thankful for gyms and fitness helping me feel great about my body. I have gratitude for all of nature. I pride myself in my innate ability to offer gratitude and have others feel it deeply. I am grateful for the loyal people in my life. I am grateful for the money I have to pay for the things I need. I am grateful for the power of gratitude for it feels great when I bestow it. I am thankful for all the great memories I have that make me smile. I am thankful for my digestive system for it helps me stay healthy. I am thankful for all the functions of my body that happen so naturally, keeping me alive. I show gratitude for the ground that I walk on. I am grateful for the clothes that I wear. My mind is full of thoughts about gratitude and the things I am thankful for. I find thankfulness is the little things in life. I give gratitude that my health is good. I am grateful to have such a strong spiritual connection. I feel so fortunate to have the ability to talk and communicate. I am grateful for my connection to God/Universe. I am thankful for how my parents raised me and what they taught me. I am thankful for my pets and their ability to show me unconditional love. I am thankful that I can become a better me each day and that feels great. I am grateful for my favorite restaurants to cook for me when I don’t want to cook. I am grateful for the electricity that heats my home and provides fire for my burners. I appreciate the fact that I have a family that loves me. My mind always defaults to things I am grateful for. I love myself and am thankful I have my own back. I am my biggest fan. I am grateful to be the winning swimming sperm to make it here! I am thankful for the people who have shaped and molded me into who I am. I am thankful to not be where I was but not content with where I am. I am thankful for the people in my life who showed me how I do not want to be or become. I am thankful for the power of forgiveness and it’s ability to help me let go. I am thankful for the power to make my dreams come true. I show gratitude now for all my senses and their ability to help me enjoy this life fully. I am thankful for sunsets and sunrises that show me the beauty of this world. I am thankful for my spine and good posture that keeps me upright. I am thankful that I have all my limbs. I give thanks for the prayers that have been answered and the ones that will be in the future. I am grateful for having a big vision for my life. I unleash the power of gratitude whenever I come upon tough times. I begin to know myself more and more each day and am thankful for this. I am grateful to see the light at the end of the tunnel. I am grateful that I can talk to God whenever I want. I am grateful for all my material possessions. I give thanks for the people who make my life easier. I am thankful for my ability to see more things to be grateful for in my life, making me happy all day long. I commit to being grateful regardless of my circumstances. I always wake up feeling grateful for life and for myself. My life has so much meaning and I am grateful for that fact. I feel so appreciative to have the ability to learn more and more to make myself better. I am grateful and excited about all that is to come. I am grateful for the soldiers who are keeping me protected. I am thankful for the ability to read and write. I am grateful for night time because it makes me appreciate day time. I am grateful to have hot water to bathe in. I feel thankful for all the good in the world. I am grateful for feel good foods that I can indulge in. I am thankful for funny movies and comedians who help me laugh out loud. I am grateful for the ability to learn and grow. I am thankful for all those who have forgiven me for my wrongdoings. I find deep gratitude in the feeling of being loved by my spouse/lover. I am grateful that everything in my life is happening for a reason. I am thankful for people who believe in me and keep me motivated. I am grateful for the ability to walk and keep upright. I am thankful for all the vacations I have been able to take. I am grateful for my ability to transform and reinvent myself. I am thankful for the new people coming into my life who are going to make it even better than it is. I am grateful for my individual gifts and my ability and opportunity to nurture them. I am deeply thankful in times where all hope seems to be lost, I still find something to be grateful for. I am thankful that I have so many things to be thankful for. I naturally find myself giving gratitude to strangers. I mediate on gratitude and thankfulness. I find gratitude is feeling that I am here for a purpose. I give thanks for all the potential I have and am going to tap into throughout my whole life. I am thankful for future experiences that are going to bring me happiness and peace. I am pleased with how my life is right now and the loving people in it. I am thankful for the tough times in my life for they help me appreciate the good times that much more. So there we are my friend. A list of positive affirmations for gratitude. I know this one helped me see how much I really have to be thankful for. And put my life into perspective in a big way. I hope it did the same for you. I would love to hear what you thought about the list of affirmations. Which ones were your favorite. If you have any good ones to add that you have used or have gotten value from. Along with what you are truly the most grateful for in your life right now.